Tattoo infections aren't always the first thing that most people think about after they've just gotten their dream tattoo after months of waiting for their appointment - however, getting an infected tattoo after leaving the studio is a very real possibility, and something you should definitely be wary about. 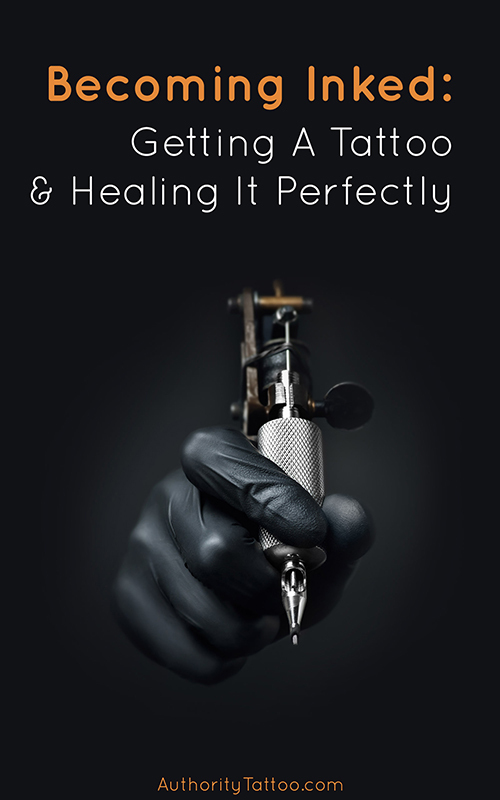 Whether you've just gotten a new tattoo, or are thinking about getting one, you should definitely be aware of the problems that can arise should your tattoo aftercare not go to plan, or if your artist fails to follow the correct hygiene procedures. Although uncommon, tattoo infections do occur, and hopefully this guide will help to educate you about the dangers of infected tattoos, how to spot them, and what to do in order to successfully treat them. What Is A Tattoo Infection? What Causes Tattoo Infections & How To Prevent Them? 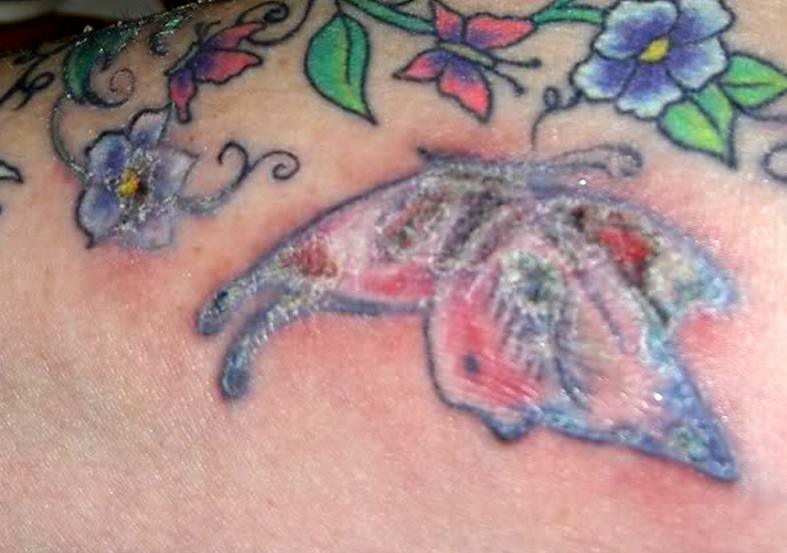 What Happens After a Tattoo Infection? Most of the time, people are generally extremely happy and excited after getting a brand new tattoo, and expect their ink to heal beautifully over the next few weeks. Unfortunately though, the tattoo healing process doesn’t always go to plan, and of all the problems that your new ink may encounter during these early and important days, an infected tattoo is amongst the worst and most feared. 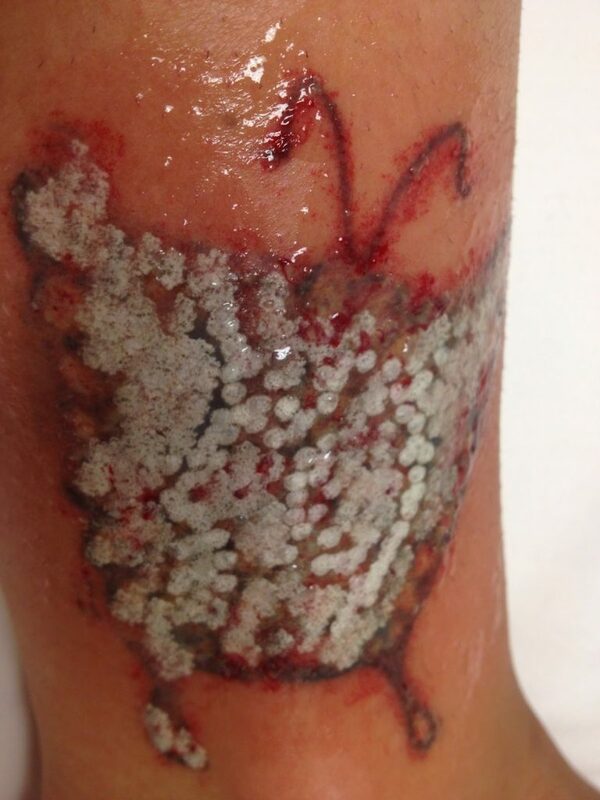 Straight after getting a new tattoo, the area is essentially just a large and open wound that is very vulnerable to germs and bacteria until the skin is able to protect itself by creating a formation of scabs over the wound before finally regenerating a permanent outer protective layer of skin over the area. However, when these nasty germs and bacteria gain entry to the wound, your immune system may not be able to stop them from causing damage and death to the surrounding tissue. This damage is what is known as an infection. There are many hundreds of types of skin infections, and each of them have different characteristics and severity. Lots of times, an infection remains only very minor and localized to the area, and these small infections can actually heal by themselves over the course of between several days to a couple of weeks. Sometimes however, tattoo infections can become much more serious and affect not only the area of tattooed skin, but also tissue much further away from the initial infected site. If left untreated, some infections can actually lead to blood poisoning, shock, and even eventually organ failure and death. Although the above circumstances are generally extremely rare, and can be treated successfully if acted upon quickly enough, it's still worth remembering that a tattoo infection is nothing to take lightly no matter how minor you believe the infection may be. 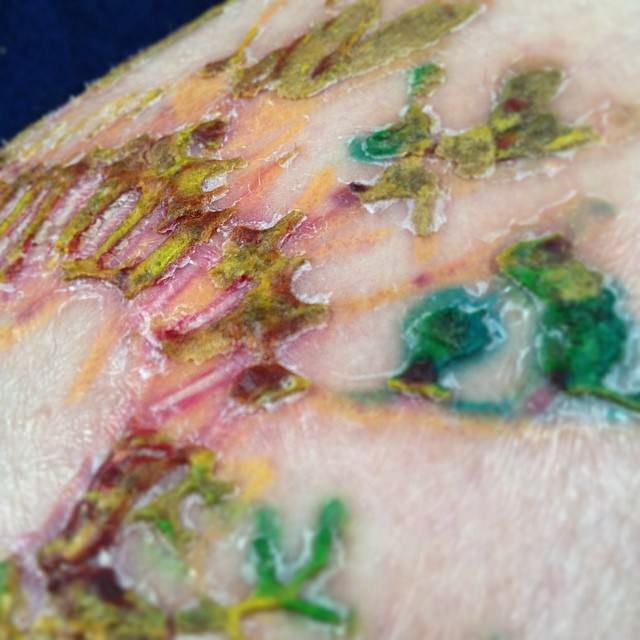 Although all cases of tattoo infections stem from bacteria getting into the wound, there are multiple ways in which this bacteria is able to actually get into the wound in the first place. This is by far the biggest cause of tattoos getting infected. When getting a tattoo, it is imperative that the shop/environment where the tattooing process is taking place is entirely clean and decontaminated of any nasty bacteria. Not only this, but all tattooing equipment such as needles and ink pots must be completely sterilized, and whatever equipment/apparatus that isn’t brand new and straight out of a packet should be wrapped in new film or other form of coating before every procedure to ensure that all surfaces remain sanitary and the risk of bacteria spreading is neutralized. 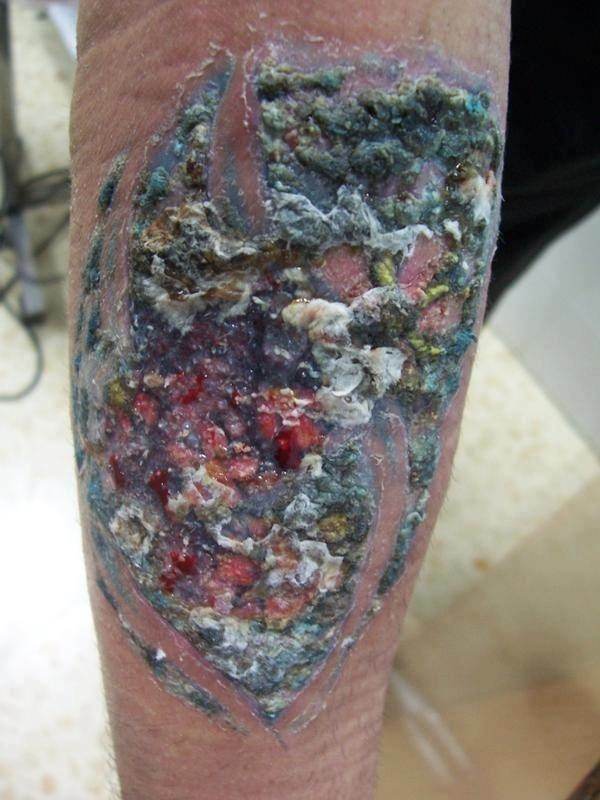 If you get a tattoo done in an unofficial shop/studio (such as a friend's bedroom) where the equipment hasn’t been properly cleaned, and the ink is homemade, there is a very high chance that one of the millions of types of infection-causing bacteria will be transferred into your tattoo wound. This very often greatly increases the risk of an infection forming - especially if the area of skin isn’t properly disinfected after the session. It is imperative that you find a good tattoo artist to do the work for you. Equally as bad as getting tattooed in a dirty environment is not looking after your tattoo properly once you’ve left the studio. You must ensure that you keep your tattoo as clean as possible by washing the area at least twice a day (morning and night), and preferably once more during the day too, especially if you're spending the day in quite a dirty environment. Cleaning your tattoo with a gentle antibacterial soap and lukewarm water will not only help to kill 99.9% of all bacteria currently residing around the area, but will also help to keep bacteria and germs away from the wound until the next wash.
Not cleaning your tattoo efficiently can lead to a buildup of bacteria and increase the risk of infection. 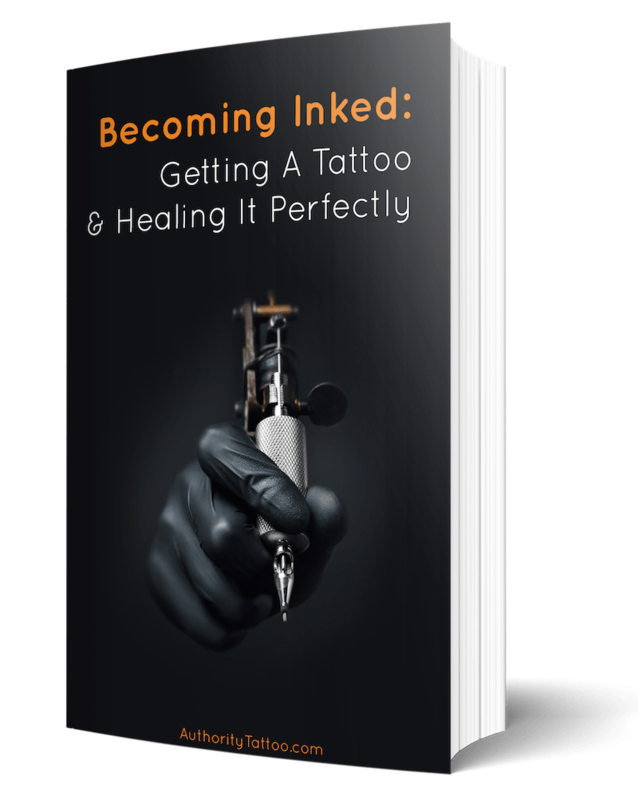 Although most artists give their customers a printed sheet containing detailed instructions about how to care for their new tattoo, some artists may not do this or may forgot. If somebody who has just been tattooed is new to the art form and is completely unaware of the amount of care that is required during the healing process, this can lead to neglect of the tattooed area, which can then lead to the possibility of an infection occurring. Once your tattoo has been completed, your artist will wash the area with a soap solution before proceeding to wrap it in order to form a protective barrier against bacteria until you’re able to get home and clean the area again yourself. 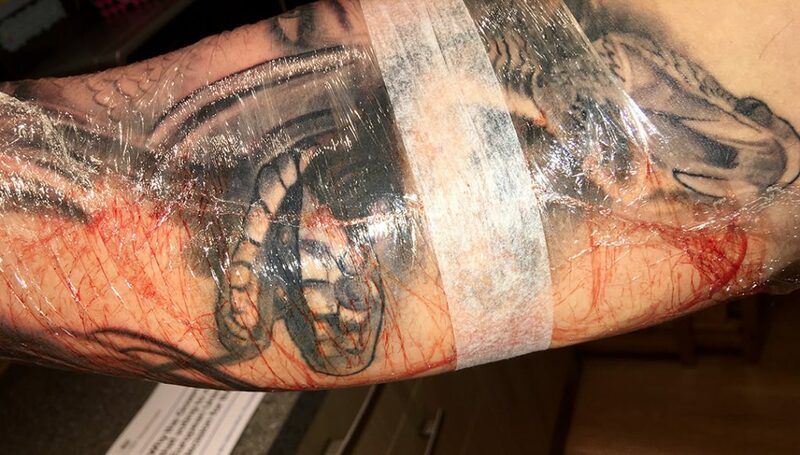 Once the initial wrap has been removed, attempting to re-wrap the tattoo yourself at any point afterwards is generally discouraged by most artists. This is because when the tattoo was first wrapped in the studio, it was done in an extremely clean environment by a professional who will have ensured that the area of skin was completely clean and free from bacteria before applying the wrap. However, when trying to attempt to re-wrap the tattoo yourself, you will be very unlikely to keep the area as clean and as sterile as it needs to be. If you proceed to wrap the area while there are pockets of germs/bacteria already on/around the tattoo, then the warm, sweaty, humid environment created between the wrap and your skin will be the perfect environment for the bacteria to breed and multiply. Therefore, this situation then becomes very high risk and the chances of contracting a tattoo infection are much higher. When your tattoo begins to heal, it will form a layer of scabbing over the area. 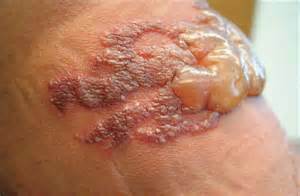 This scabbing is produced to help shield the wounded skin beneath from germs and bacteria. Although it may seem tempting to pick off a big, thick, ugly scab, this can actually be very detrimental to the tattoo healing process. Not only will pulling off the scabs further delay the amount of time in which your tattoo will take to heal, but it also increases the risk of ink being pulled out of the area - potentially creating areas of faded or patchy ink. Most importantly though, pulling a scab off of your new tattoo re-opens the wound and re-invites germs and bacteria to enter the area, increasing the risk of your tattoo getting infected. Scratching a tattoo is much like pulling the scabs off, but is in fact much more dangerous. Not only are you very likely to rip scabs away from the skin when you scratch your tattoo, which can lead to: bleeding, heavier scabbing and even scarring - but you are also transferring millions of bacteria that live underneath your fingernails straight onto your open wound. So while gently picking scabs off of a tattoo only opens up a wound for germs to enter (still bad); scratching your tattoo opens the area up to germs and then directly transfers them onto the wound! (very bad). Instead of trying in vain to stop yourself from scratching at your itchy tattoo, take a look at this guide on the many ways to stop and prevent tattoo itching. 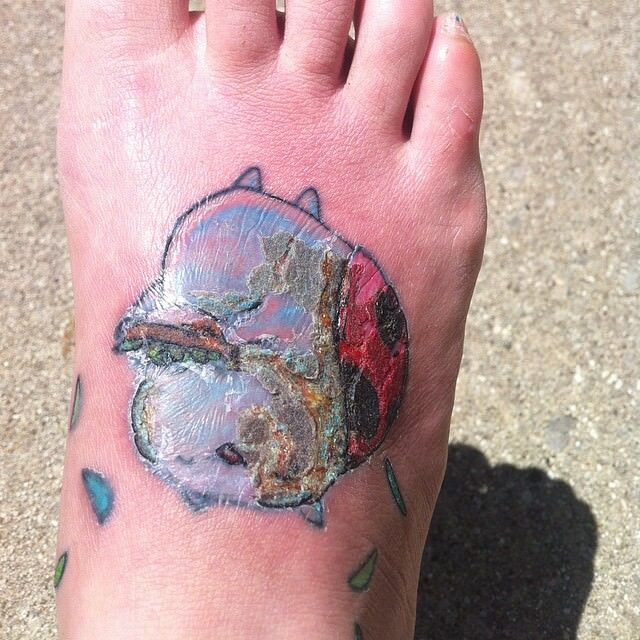 You should never let your tattoo sit in a body of water while it's still healing in the first 2-3 weeks. Although some bodies of water may look clean, they are still likely to harbor billions of bacteria. Always shower with a new tattoo (for a maximum of 7-8 minutes) and never bathe. When taking a bath you are essentially sitting in all of the germs that have been scrubbed away from the rest of your body, and these germs and can very dangerous and potentially cause an infection if they come into contact with your tattoo. Letting other people touch your brand new tattoo is an absolutely terrible idea. You have absolutely no idea where their hands have been since they last washed them, and having their dirty hands rub all over your new tattoo is just asking for an infection. Only ever allow your tattoo to be touched by yourself, and ensure that your own hands have been thoroughly cleaned immediately before touching the area to ensure that there is absolutely no bacteria present. Although tattoo moisturizing lotion can definitely help to speed up the healing process, applying too much of it at once can actually cause problems. 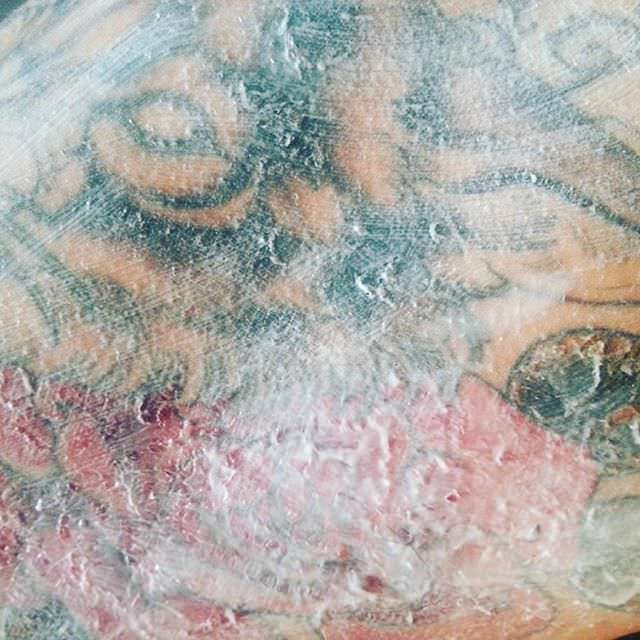 When you slop on a thick layer of lotion or ointment onto the top of your tattoo, you're not only suffocating your tattoo of oxygen, which it requires to heal efficiently, but you are also creating a warm and humid environment between the layer of lotion and your skin which is the perfect place for bacteria to breed. Always ensure that your tattoo is completely clean and dry before applying lotion, and only add a very thin layer to your skin - just enough to make the area slightly shiny. A fit and healthy body is very effective at neutralizing any threats presented to it by healing wounds efficiently and killing any bacteria/germs quickly before they can cause too much damage. However, various life choices can greatly affect the immune system and decrease its effectiveness when to comes to fighting off an infection. For example, if you eat a healthy and balanced diet whilst getting good sleep throughout the healing process (7-8 hours a night) then you're giving your immune system the best chance of fighting away any potential threats. Alternatively, if you decide to only get 4 hours of sleep a night, or decide to go out and get drunk 3 nights a week during the most important healing stages, then you are much more likely to contract a tattoo infection due to your less-than-optimal immune system and healing capabilities. As above, various medical conditions and afflictions can also greatly affect the capabilities of your immune system. Because of this, it is always extremely important to ensure that you consult a medical professional before getting a tattoo to ensure that the process won't greatly increase the risk of infection or otherwise seriously impact your health. Contracting a virus, disease or other illness around the time of getting your tattoo can also ​weaken the immune system. You must be aware that the symptoms of a tattoo infection will vary greatly depending on many different factors including: The type of bacteria causing the infection, the location of the infection, the size of the wound, how your body responds to the infection and how long the infection goes on for before treatment is commenced. However, below is a list of the most common visual/physical symptoms of an infected tattoo. Whilst you will very rarely experience all of the symptoms at once - generally, the more symptoms that are showing concurrently, the more likely that an infection will be present. It should be stated that you mustn’t become too alarmed if your new tattoo shows signs of a few of the common symptoms listed below (like redness, mild pain and swelling). Several of these symptoms can also appear on a healthy tattoo that is healing as it should be. Generally, all new tattoos will cause some amount of pain in the first few days, and the bigger the tattoo, the more painful the area usually is, and the longer the pain normally takes to completely go away. However, if your tattoo starts to cause an excruciating, searing pain, or if the tattoos is still very painful to touch after 7-10 days (or if the pain is getting worse instead of getting better) then this could be the sign of a possible infection. Rashes can come in many different shapes, sizes, textures and and colors. 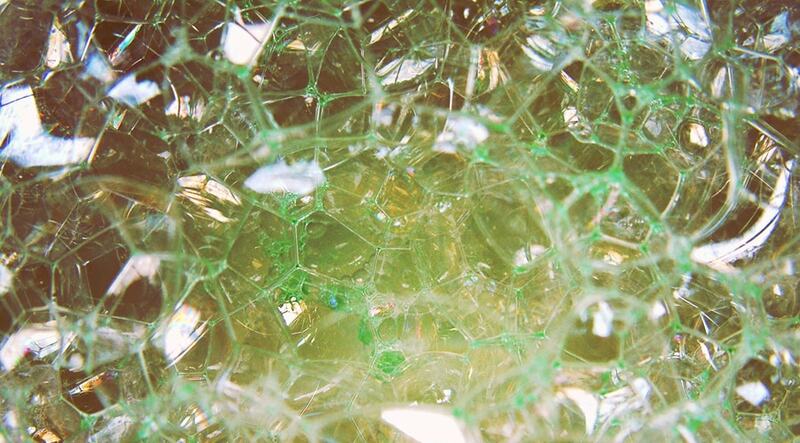 Whilst many rashes will just be red and smooth, many will also be bumpy and pimply. 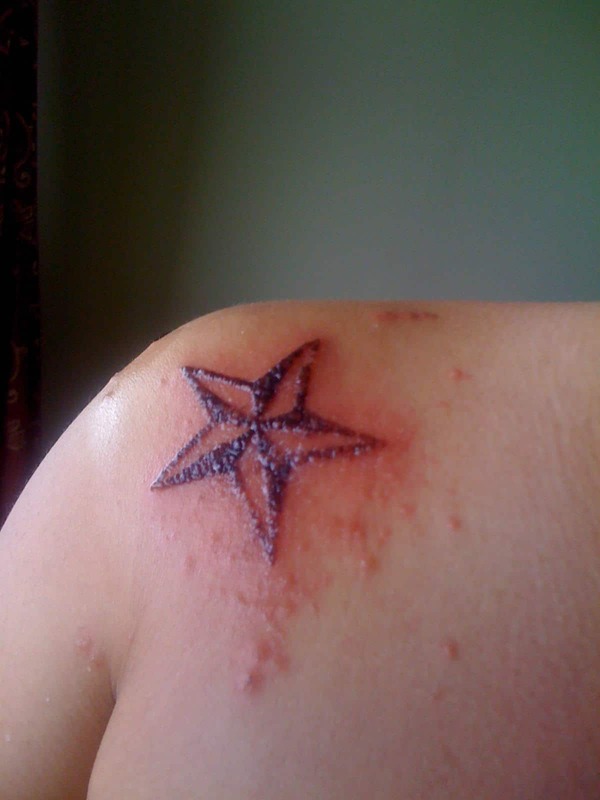 Whilst a rash on a tattoo commonly just signals minor irritation to the skin, it can also be a sign of infection - especially if it continues to get worse or grows larger and outwards from the area of the tattoo. Nearly all tattoos will be red and inflamed for a few days afterwards ( or longer if the tattoo is particularly large), however, if a tattoo continues to get even more red over the course of 5-7 days after getting a tattoo instead of gradually fading, then it could mean that an infection has set in. Most tattoos will be warm to the touch for a few days due to the bodies natural healing reaction to the tattoo (increased blood flow to the area will naturally increase the temperature of the site). But if your ink becomes very hot to the touch, or is still warm/hot to the touch after a week then this can be the sign of a possible infection. Whilst annoying itching is common with a new tattoo, especially if the tattoo becomes very dry, getting an itch that never goes away or becomes so extreme that you cannot handle it can be the sign of an infection, especially if the itching doesn’t go away after tempting to soothe the area with a good tattoo lotion. An infection is also much more likely if the itching is accompanied by one or more of the other symptoms in this list. Swelling is quite common with new tattoos, especially if the tattoo is situated below the waist (legs/ankles/feet) or on a very tender and thin piece of skin like the inner bicep. If the swelling is very bad, and continues to spread away from the site of the tattoo and fails to reduce over the course of 7-10 days then this could be caused by an infection. Scabbing is entirely normal during the tattoo healing process, and the odd thick, unsightly scab is not uncommon, especially if the tattoo artist was quite rough with the needle. However, if the whole tattoo becomes full of crusty, thick, itchy scabs that also begin to ooze and bleed then this could be the sign of an infection. 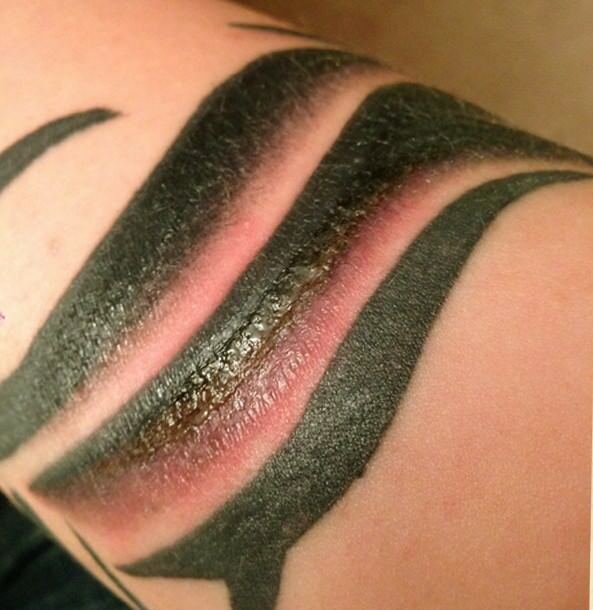 Infected tattoos generally looks very uneven due to thick crusts and dried blood/plasma. Blisters are not a common side-effect of getting a tattoo and therefore any blistering on the skin around the tattooed area should be seen as suspicious and potentially the result of an infection. All blisters on tattoos should be investigated. Pimples can be common on a new tattoo and are generally not a problem, however if you develop pimples that begin to ooze and pus, or develop into large, painful boils then an infection is likely. Pus can be either clear and runny or thick and gloopy depending on the type of infection. You should be aware that for the first couple of days, your new tattoo will likely ﻿﻿leak small amounts of blood, ink and plasma, so don’t get worried and mistake this for an infection. If this happens to you in the first day or two - it is likely to be completely normal. Foul odor being omitted from a tattoo is normally accompanied by oozing and pussing, and is generally a sign that there is an infection taking place - get the tattoo looked at by a professional. Bleeding normally slows down once the tattoo has been completed, and normally fully stops after the first 2-3 nights afterwards due the clotting and scabbing that form around the area. 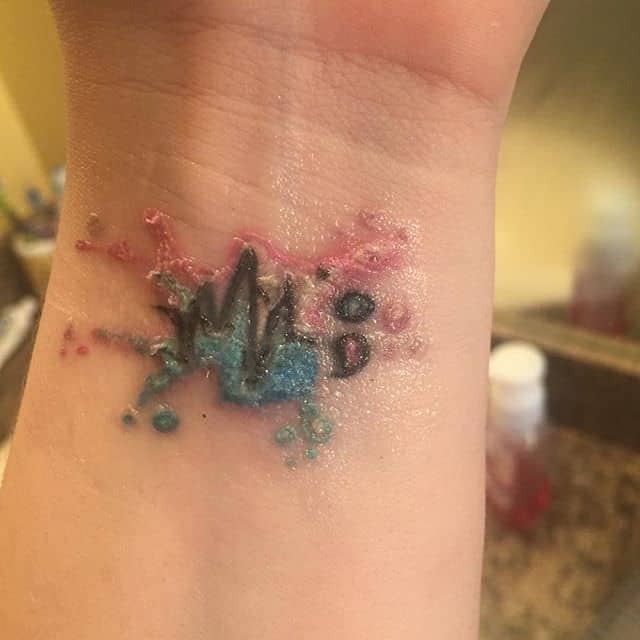 An infected tattoo can begin to bleed again after this timeframe however, especially if the area has heavily scabbed over and begins to crack and ooze. If long lines of redness appear that look as if they’re streaking away from your tattoo then you should seek medical attention immediately as this is a symptom of septicaemia - also known as blood poisoning, which is not the same as tattoo ink poisoning. This can be caused by an initial infection and can be life threatening if not treated promptly. There are small lumpy nodules located all around your body called lymph nodes that help to filter out impurities from your blood. If there is an infection present, the lymph nodes that are situated closest to this infection generally begin to swell (they are commonly found in the groin area, armpits and neck). If you have a new tattoo that is displaying one or more symptoms in this list, and you also have a swollen lymph node nearby, then this is a possible sign of infection. Generally, all infections have the ability to raise the core body temperature and cause lethargy/extreme tiredness. Therefore if you have a high temperature/fever/extreme tiredness in addition to one or more other symptoms in this list then you may have an infected tattoo. Some of these symptoms can also be mistaken for normal tattoo healing as they can be very similar, and vice-versa. The best way to differentiate is to rate the severity of the symptom. Symptoms of an infections tend to be much worse than common side-effects of healing, and whereas symptoms caused by general healing will slowly go away, symptoms of an infection will normally remain the same or continue to get worse. The first thing to note is that all suspected infections should be treated seriously. As soon as you suspect that your tattoo is infection then you should get in touch with your tattoo artist as soon as possible so they can arrange to look at the tattoo and advice what they think about the situation. If the symptoms of the suspected infection are especially severe however, you should seek medical attention and see a doctor as soon as possible. The doctor will then assess the situation. 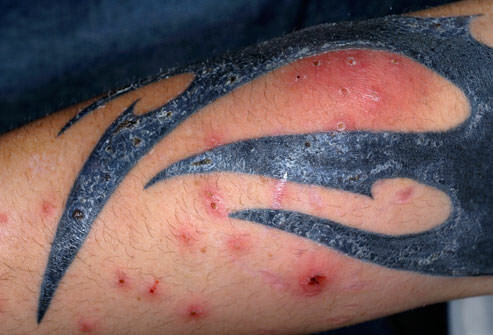 Antibiotics and steroidal administration are common treatments, and less common methods include tattoo infection drainage - and in extreme circumstances, emergency admission to hospital. Remember - even if the infection is only minimal and localized to a small area of your tattoo, it may still seriously affect the long-term appearance of your ink if not treated quickly. 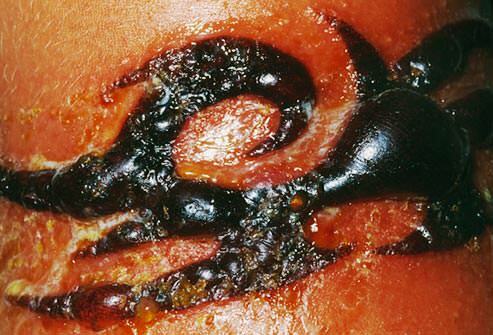 If left too long, an infection can eventually spread to wider areas around the tattoo and begin to cause further damage. If the sore is itchy or swollen then applying ice to the area can help to soothe and minimize the symptoms. Make sure not to apply ice directly to the skin though - always make sure there is a damp cloth placed between the ice and your skin to prevent further damage to the area. Exposing the wound to fresh air regularly (especially if it’s being regularly wrapped in a bandage) allows the skin to take in sufficient oxygen, which in-turn should help to speed up the healing process. You should ensure that you keep the area as clean as possible to prevent the infection from spreading further. 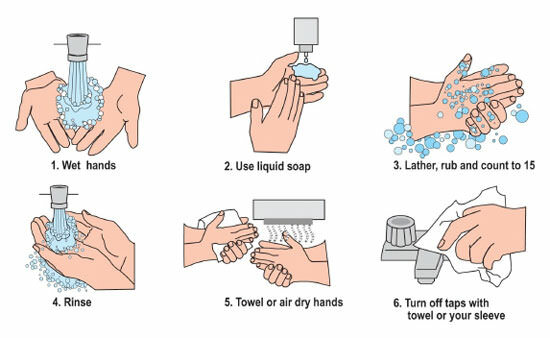 Clean the wound at least 3 times a day and make sure to pat the area completely dry with a clean paper towel. 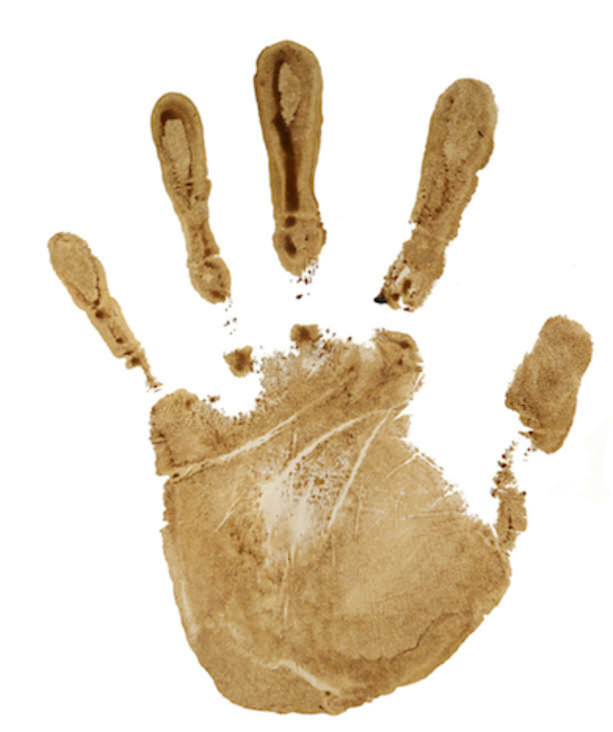 Dry skin is much less inviting to germs and bacteria compared to wet or damp skin. The tattoo cleaning guidelines shown here are sufficient for both infected tattoos and also completely healthy ones. Applying a bandage to the area can help to protect the tattoo as it heals from an infection and to stop the raw wound from rubbing against anything. However, some tattoo artists and doctors may recommend against applying a bandage to the area depending on the specific type of infection and the area of skin. A new tattoo is very sensitive to UV rays and sunlight at the best of times, and will likely be doubly sensitive and much more prone to burning if it’s infected - therefore you should do your best to keep the tattoo out of direct sunlight until it's completely healed. Suncream will most likely aggravate the problem further and suffocate the wound so do not apply any kind of tanning lotion to the wound while it's healing either. If your tattoo has become very swollen, then taking an anti inflammatory such as aspirin should help to increase comfort levels by reducing the swelling to a more manageable level. If your tattoo is particularly sore and painful then taking painkillers may help to alleviate the suffering. 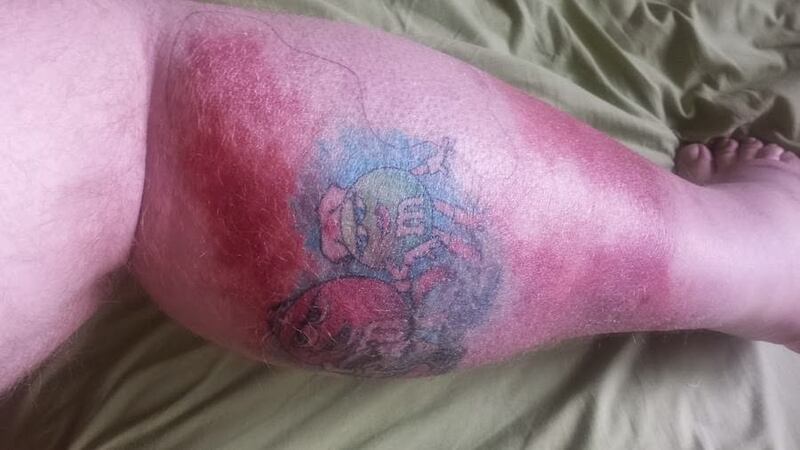 It's relatively hard to predict the outcome after suffering an infection on a new tattoo. A tattoo with only a very minor infection should recover with minimal long-term damage caused to the appearance of the tattoo. 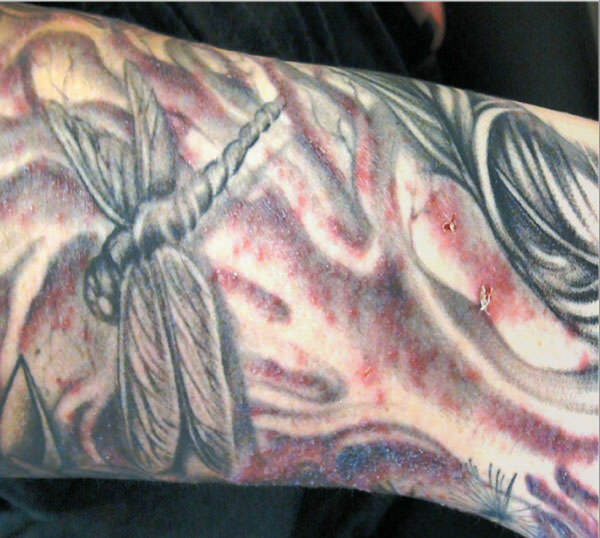 A moderate infection that covers quite a large area of the tattoo may cause some fading and patchy areas of ink - hopefully however, your artist may be able to touch up these areas and restore the appearance. A major infection that went deep into the skin and covered large areas of the tattoo doesn’t have such a great outcome unfortunately. 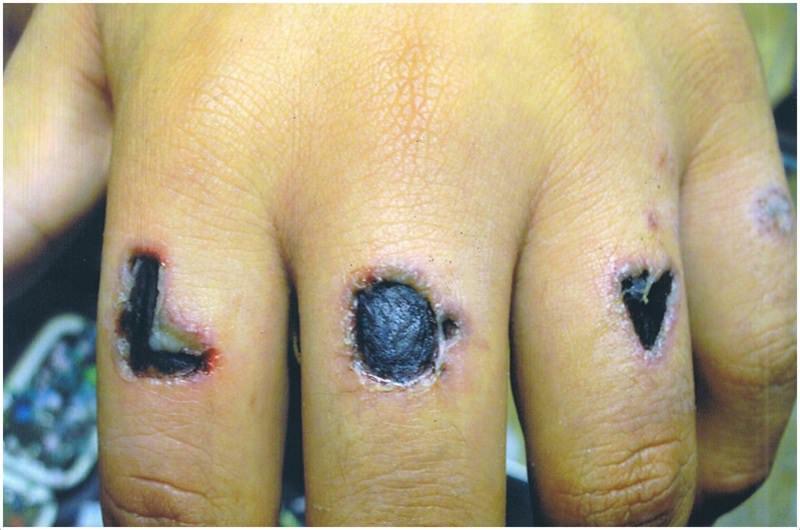 These kinds of tattoo infections can cause large areas of washed out fading, not to mention scarring and permanent dips/grooves in the skin from where the infection was eating away (see image below). 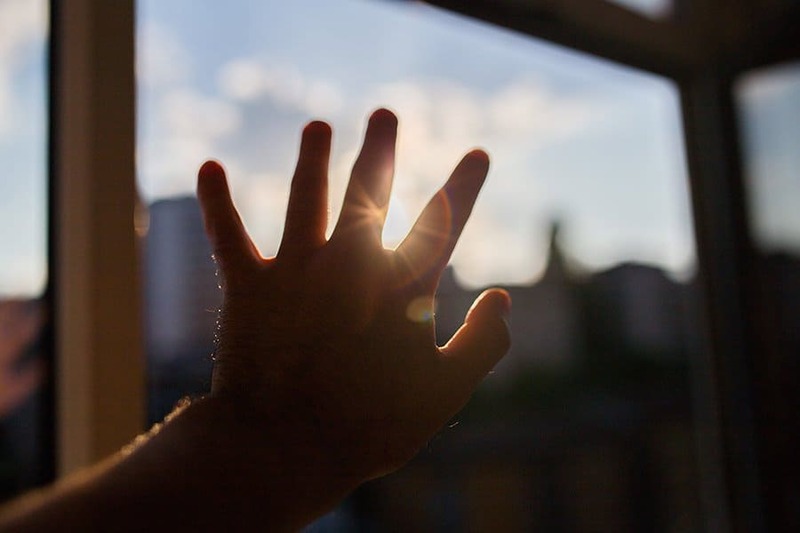 Healing times can also vary greatly depending on: The type of infection, the severity of it, and what medication/treatment is being administered. If your infection was relatively severe then you may unfortunately not be able to ever restore the tattoo to its proper appearance, and you may even have to laser (remove) the tattoo if it becomes completely disfigured. However, your first step should always be to go back to your artist to ask for their professional opinion on what to do next in the interest of your tattoo’s appearance, and whether it can be restored or not. As you can see, tattoo infections really can be unpleasant. However, by being aware of the causes, signs and symptoms, you should better equipped to avert the threat of an infection. Don’t forget that by getting an infected tattoo looked at by a professional as quickly as possible, you have the best chance of saving your ink, and therefore giving it the greatest chance to flourish and become a beautiful tattoo once it‘s recovered.